In all lytic phage infections, the phage nucleic acid enters the bacterium while its protein coat remains on the outside. Since only nucleic acid enters the cell, the nucleic acid must code for the protein in the phage coat. The nucleic acid is replicated along with phage proteins, resulting in the formation of many virions. At the end of the replication cycle, phage exit by lysing the bacterium. Phage that go through this productive life cycle are termed virulent. One of the most intensively studied virulent phages is the double-stranded DNA phage, T4 (see figure 13.1). 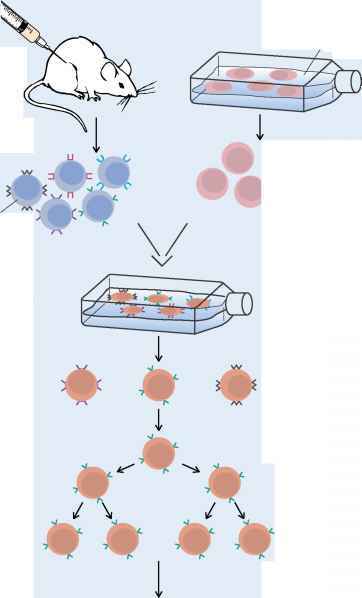 Its replication cycle illustrates how a phage can take over the life of a cell and reprogram its activities solely to the synthesis of phage (figure 13.5). When a suspension of T4 phage is mixed with a susceptible strain of E. coli, the phages collide by chance with the bacteria. Since viruses do not have flagella, they cannot swim toward their hosts. Protein fibers at the end of the phage tail attach to specific receptors on the bacterial cell wall (Step 1). These receptors generally perform other functions for the cell, such as transport functions. The phage use these structures for their own purposes. A few minutes after attachment, an enzyme (lysozyme) located in the tip of the phage tail degrades a small portion of the bacterial cell wall. The tail contracts, and the tip of the tail opens. The double-stranded linear viral DNA in the head passes through the open channel of the phage tail (Step 2). The DNA is literally injected through the cell wall and, by some unknown mechanism, passes through the cytoplasmic membrane and enters the interior of the cell. The protein coat of the phage remains on the outside of the cell. Thus, the protein and nucleic acid separate, a feature of all virus replication. Within minutes of the entry of phage DNA into a host cell, a portion is transcribed into mRNA, which is then translated into proteins that are specific for the infecting phage (Step 3). The first proteins produced, termed early proteins, are enzymes that are not normally present in the uninfected host cell. They are also known as phage-induced proteins, because they are coded by phage DNA. Some are essential for the synthesis of phage DNA, which contains an unusual pyrimidine, and others are involved in the synthesis of phage coat protein. One phage-induced early protein is a nuclease that degrades the DNA of the host cell. As a result, soon after infection, host cell DNA cannot be transcribed and all mRNA synthesized is transcribed from the phage DNA. In this way, the phage takes over the metabolism of the bacterial cell for its own purpose, namely the synthesis of more phage. Preexisting bacterial enzymes, however, continue to function. Some supply the energy necessary for phage replication through the breakdown of energy sources in the environment. The host enzymes also synthesize amino acids and nucleotides for the production of phage proteins and nucleic acids, the former being carried out on the bacterial ribosomes. Not all phage-induced enzymes are synthesized simultaneously. Rather, they are made in a sequential manner during the course of infection. Those required early are synthesized near the beginning of infection; others that are not required until later in infection are made later on. Examples of early-induced enzymes are the nuclease that degrades the host chromosome and the enzymes of phage DNA synthesis. Late-induced enzymes include those concerned with the assembly of capsids and the phage lysozyme that lyses the bacteria to release the newly formed phage. The phage attach to specific receptors on the cell wall of E. coli. 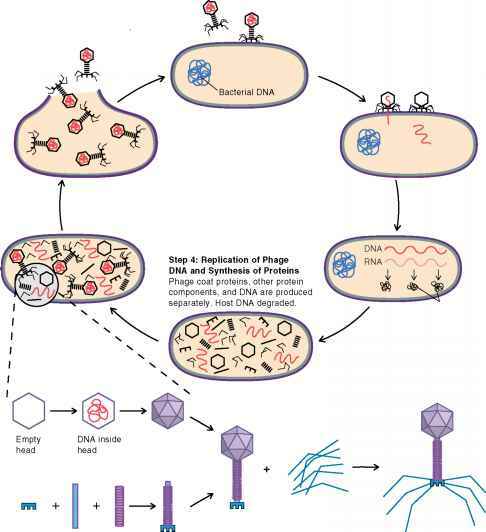 Following attachment, phage DNA is injected into the bacterial cell, leaving the phage coat outside. Phage components are assembled into mature virions. Phage DNA is transcribed, producing phage mRNA, which is translated to phage proteins. The assembly or maturation process involves the assembly of phage protein with phage DNA to form intact or mature phage (Step 5). This is a complex, multistep process in the case of T4 phage. The protein structures of the phage, such as the heads, tails (sheaths), tail spikes, and tail fibers, are synthesized independently of one another. Once the phage head is formed, it is packed with DNA; the tail is then attached, followed by the addition of the tail spikes. The synthesis of some of these various components involves a self-assembly process, in which the protein components come together spontaneously without any enzyme catalyst to form a specific structure. In other steps, certain phage proteins serve as scaffolds on which various protein components associate. The scaffolds themselves do not become a part of the final structure, much as scaffolding required to build a house does not become part of the house. During the latter stages of the infection period, the phage-induced enzyme lysozyme is synthesized. This enzyme digests the host cell wall from within, resulting in cell lysis and the release of phage (Step 6). This enzyme must not be synthesized early in the infection process, because it would lyse the host cell before any mature phage could be formed. This is why phage genes are expressed only when the enzymes for which they code are needed. In the case of the T4 phage, the burst size, the number of phage released per cell, is about 200. The time required for the entire cycle from adsorption to release is about 30 minutes. These phage then infect any susceptible cells in the environment, and the process of phage replication is repeated. The most thoroughly studied temperate phage whose DNA is integrated into the E. coli chromosome is lambda (A). Its size and shape are similar to T4 phage. 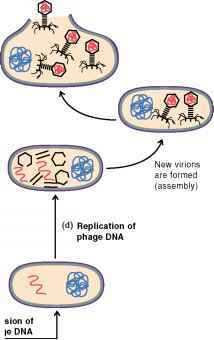 Once the phage DNA enters the host cell, one of two events occur. Some of the bacteria will be lysogenized, while others will be lysed (figure 13.6). Whether the lambda phage lyses the majority of the cells or lysogenizes them depends largely on chance events that can be tipped in favor of one or the other by modifying the external environment. For example, if the bacteria are growing slowly, because of nutrient deprivation, then the likelihood of the phage DNA becoming integrated is increased because phage replicate vegetatively only in actively metabolizing cells. Figure 13.6 Lambda Phage (l) Replication Cycle Depending on the environmental conditions, A phage may go through the lytic cycle (a) or may lysogenize the cell (b). As culture conditions change, the phage DNA in a lysogenic cell may be excised (c) from the bacterial chromosome and (d) enter the lytic cycle and the phage undergo vegetative reproduction. Note that unlike the case of phage T4, phage A does not destroy the bacterial chromosome. 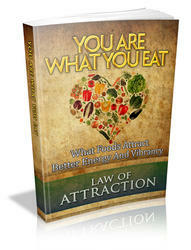 For many years, viruses have been recognized to cause many very deadly diseases of humans, animals, and plants. Within the past few years, scientists have discovered that they may play another important role in nature—that of being a major component of bacterioplankton, the bacteria found in the ocean. In the 1970s and 1980s, bacterial cells were found to be much more abundant than had been believed previously. Earlier estimates of the number of bacteria in aquatic environments were based on the numbers that could be cultured in the laboratory. When direct microscopic counts were made, however, the number of heterotrophic bacteria was estimated to be 105 to 107 bacteria per ml, much higher than previously estimated. Most carbon fixation in the ocean is carried out by bacteria. The concentration of cyanobacteria and single-celled eukaryotic algae is much greater than previously believed. What was most surprising, though, was the number of bacteriophages in aquatic environments.To get an accurate estimate of their numbers, scientists centrifuged large volumes of natural unpolluted waters from various locations.They then counted the number of particles in the pellet. Much to their surprise, up to 2.5 x 108 phages per ml were counted, about 1,000 to 10 million times as high as previous estimates. Why are these new numbers important? First, they may answer the question of why bacteria have not saturated the ocean.The bacteria are most likely held in check by the phages. From the estimates of the numbers of bacteria and phages, it is calculated that one-third of the bacterial population may experience a phage attack each day. Second, the interaction of phages with bacteria in natural water implies that the phages may be actively transferring DNA from one bacterium to another, by the process of transduction. Thus, the smallest agents in natural waters may have important consequences for the ecology of the aquatic environment. Perhaps viruses have a similar function for eukaryotic organisms. Indeed, it is now known that phages can stop algal blooms. (b) and is integrated between the gal and bio operons (c) to form the prophage, (d). If the process is reversed, the lambda chromosome is excised from the bacterial chromosome and can then replicate and code for the synthesis of phage proteins.